"This omelet with strips of kale, shredded Cheddar cheese, and bacon with a touch of Dijon mustard is perfect for a weekend brunch." Cook and stir bacon in small nonstick skillet until crisp. Remove bacon from skillet with slotted spoon, reserving 1 tsp. drippings in skillet. Drain bacon on paper towels. Add kale to reserved drippings; cook on medium heat 5 to 6 min. or just until kale is wilted. Transfer to bowl; wipe skillet clean. Whisk eggs, milk and mustard until blended. Melt butter in same skillet on medium heat. Add egg mixture; cook 5 to 6 min. or until almost set, occasionally lifting edge with spatula to allow uncooked portion to flow underneath. Top with cheese; cook until egg mixture is set but top is still slightly moist. Spoon kale onto half the omelet; top with bacon and pepper. Slip spatula underneath omelet, tip skillet to loosen and gently fold omelet in half. 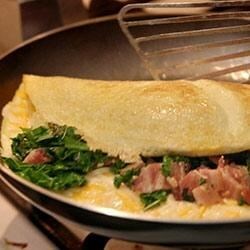 Slide or flip omelet onto plate; cut in half. Substitute fresh baby spinach for the kale. Serve with a spinach and chopped tomato salad. Very good! Substituted chicken sausage and baby kale, then I added onion and fresh mushrooms, and went too heavy on the cheese (stick to the recipe here). But we WILL be making these again. this was an amazing omlette and even my 5 year old picky eater liked it !!!!! yum. don't skip the mustard! it makes a subtle and delightful difference from boring to fabulous! Yummy! Love the way you assemble the omelete. I didn't think the mustard would do much but it gave it just enough taste. Hubby loved it too. I left out the bacon.